In the late 1800’s, Joseph Myers from Pugnacity, Nebraska was with some Indians harvesting their medicine plant. These Indians told him that they made a tonic from the plant and it was used for venomous bites such as bee stings, rattlesnake bites & mad dog bites, infected wounds, and fevers. The Indians basically told him that they used it to treat and cure just about everything that came along. Joseph started making his own tonic from the plant and a diluted mixture of whiskey. He started traveling the Wild West selling it as the cure for all. One day through near misfortune he found out for sure that the venomous bite of a rattlesnake would not brother a person if they drank a bottle of his secret tonic. Eventually he caged a few rattlesnakes and would use these snakes to promote sales. If a large enough crowd happened to gather, he would let one of these deadly snakes bite him and he would drink his magic potion to prove his claims. This drastically increased his sales. Eventually he became just a drunkard traveling the Wild West with rattlesnakes and selling his cure all secret potions. He became popular to many people and they nicknamed him the “Snake Oil Salesman”. These people would buy his product as a painkiller and to deal with a large variety of medical problems or emergencies. Around this time in history had developed one of the largest herbal druggists in the US. They called themselves the Lloyd Brothers Drug Company, which was located in Cincinnati, Ohio. They produced the best herbs of this era and almost every doctor depended on them. There was a man who wrote the American Dispensatory on every herb known to man. Joseph Myers heard about this person, Professor King and wanted to know the name of the plant, which was in his secret formula. So he sent a case of this formula to the Professor asking him if he could name the plant. The Professor wrote Joseph back and asked what kind of a nut he was? That no one could identify any herb from a bottle of colored whisky. Professor King put the matter aside and stored the case of herbs. As the story goes a few months later Professor King wife developed cancer and even though he was one of the top herbalists in the country and used some of the best herbs (Lloyd Brothers) nothing seemed to help her. She was getting worse and worse and she was close to death but then overnight she started getting better and went into remission. The Professor asked her what herbs or tinctures she was taking because he felt it was the cure for cancer. She told him that she had given up and stopped taking all his herbal medicines. For about 3 weeks she had been drinking the case of herbal whiskey. She said it helped kill the pain and made her feel great and hope she could get some more wonderful stuff. So the professor wrote Joseph Myers and had him dig up a plant and sent it to him. He then identified it as the Echinacea Purpurea, which is a wild plant that normally grows all over the Midwest. Since then there has been thousands and thousands of life saving stories related to this single herb. Around the 1920’s the wealthy started manufacturing modified (adulterated) herbs into drugs because then these items could be patented for huge profits. The public was eager in believing that modern science was developing better substances than God’s original designs and these new products sold easily. It was stated that God gave man the knowledge to make these magical drugs that millions would eventually die from. And God had told these people a couple thousands years before that “Nations will be deceived”. God loves us and wants us healthy and is not controlled by money and will not lie for it. And with huge profits from drugs the manufactures lobbied and change the laws within our country. This forced thousands of doctors to remove safe herbs from their selves and to use only the processed products, which were basically unsafe and causing a multitude of reactions or deadly consequences. Today over 180,000 die a year from the reaction of pharmaceutical process drugs. But how many more die from the reaction of the drug but on the death certificate the doctor called it a liver or kidney failure or the heart stopped, etc? And why when major hospitals in an area close down the death rate goes down around 50% every time? And these manufactures of drugs established their own governing unit called the AMA. This allowed these people to make laws that controlled how doctors practiced medicine and profits were made. And of course it forced doctors to use only their products and made it illegal to use safe herbs or diet plans from the doctor’s office. This was one of American’s first controlled health freedoms. 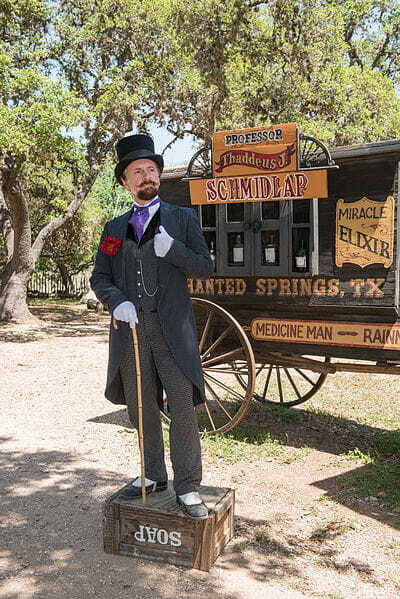 The next time you hear the term snake oil used in a degrading manner you will know the intelligence level of that person or doctor.